The North British Railway (NBR) carried large quantities of perishable traffic, of which fish from Mallaig and Aberdeen was probably the most famous. 0-6-0 locomotives were initially used for this traffic, but Reid designed these mixed traffic 4-4-0s specifically for this perishable traffic. One batch of twelve engines was ordered in 1905, and built at Cowlairs in 1906-7. Often known as 'Intermediate Passenger' or 'Intermediate Goods', the Class K (LNER D32) engines were often known simply as 'Intermediates'. The D32s were built with saturated 5ft 1.25in diameter boilers, 6ft diameter driving wheels, and 19in x 26in cylinders were operated with piston valves. The resulting mixed traffic design proved to be very successful, and would become a basis of all future NBR 4-4-0 designs. The LNER fitted Diagram 79 boilers with 22 element Robinson superheaters between 1923 and 1926. These rebuilds followed the NBR traditional of rebuilding locomotives when their original boilers were due for renewal. Although the D32s were built with lock-up safety valves, many of the replacement superheated boilers were fitted with Ross pop safety valves. The rebuilds included the fitting of Wakefield eight-feed mechanical lubricators. During the superheating process, the original locomotives were known as D32/1, and the superheated locomotives were known as D32/2. One spare boiler was built in 1933 and proved satisfactory until 1946 when ten spares were built for the D29 Scotts, D30s, D32s, D33s, and D34 Glens. Only one of these spare boilers was fitted to a D32 before they were withdrawn. Most of the D32s were initially allocated to Eastfield. The exceptions were two allocated to Berwick, and one to Montrose. All twelve were used on long distance express goods traffic. St. Margaret's quickly received a small allocation for services to Newcastle, and shorter workings such as to College via Bathgate. The D32s were quickly found to be useful for passenger services, and were often used for excursions including NBR staff outings from Glasgow. The Eastfield engines were also often used for passenger services over the West Highland line. During World War 1, No. 981 at St. Margaret's was often used for troop trains from Blairgowrie to Carlisle via the Tay Bridge, Forth Bridge, and Waverley route. By the end of World War 1, the 'Intermediates' were being mainly used on passenger services. This would continue until their withdrawal. At Grouping (1923), the D32s were allocated to: St. Margaret's (6), Berwick (3), Dundee (2), and Thornton (1). By this time, all twelve engines were being used on passenger services to and from Edinburgh. Frequent destinations included Berwick, Galashiels, Corstorphine, and on the Musselburgh branch. By the 1940s, the D32s were mainly found hauling stopping services and local suburban services. However, they could still be seen on the occasional football special. The introduction of large numbers of Thompson B1s led to the final demise of the D32s. Withdrawals started in 1947 and were quick. 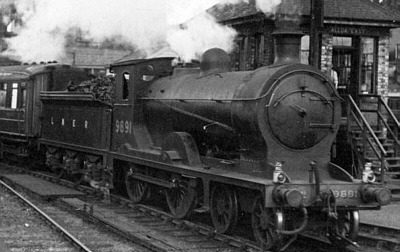 Ten survived into British Railways ownership (1948). The last two D32s were withdrawn in December 1949 (No. 2445), and March 1951 (No. 62451). The following table lists the original saturated boiler (D32/1) and 1923 superheated boiler (D32/2) variants. A spare Diagram 79A boiler was built in 1933, and a Diagram 78 boiler was built and fitted after 1946. Both of these boilers retained the 22 element superheaters, but they had slightly larger heating surfaces of 1379.12 sq.ft. and 1448.62 sq.ft. respectively. Cylinders (x2): (inside) 19x26in. 19x26in. Heating Surface: Total: 1760 sq.ft. 1346.06 sq.ft. Firebox: 140 sq.ft. 139.7 sq.ft. Grate Area: 22.5 sq.ft. 21.13 sq.ft. The last D32 was withdrawn in 1951, and none have survived into preservation. Connoisseur Models produce a brass kit of the D32 for O gauge (7mm scale). Thank you to David Henderson for the photograph of the superheated D32 No. 9891.